On Dec. 12, Sens. Dianne Feinstein, D-Calif., and Tom Coburn, R-Okla., introduced legislation that aims to eliminate the corn ethanol portion of the renewable fuel standard (RFS). It would not affect mandates for other categories of renewable fuels. The U.S. Senate Committee on Environment & Public Works held a hearing Dec. 11 to consider the U.S. EPA's proposed rule to set 2014 volume requirements under the renewable fuel standard. The hearing featured testimony from several stakeholders. Several European biofuel groups are speaking out following the European Council's failure to reach a political agreement on how to account for indirect land use change (ILUC) in biofuel policy on Dec. 12. Rex American Resources Corp. has released its financial results for the third quarter of 2013, reporting a gross profit increase of 386 percent compared to the same period of last year. The company holds ownership interest in seven ethanol plants. 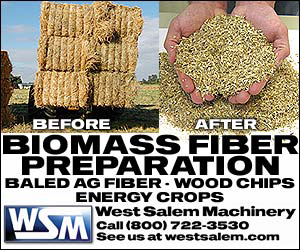 Mascoma Corp., a leading provider of bioconversion technology, has announced that its consolidated bioprocessing technology (CBP) has been used to produce over 1 billion gallons of renewable fuel. This achievement is a key commercial milestone. The government of Spain recently filed a report on ethanol with the USDA Foreign Agricultural Service's Global Information Network. The report addresses Spanish policy, production, and supply and demand data. The U.S. Patent and Trademark Office has issued U.S. Patent No. 8,597,914 to Proterro Inc., protecting its unique, biosynthetic sugar-making process. The company's technology features microorganisms that produce sugar in modular photobioreactors. The European Investment Bank is providing a loan to support the research and development projects of Biochemtex, an engineering subsidiary of the Mossi and Ghisolfi Group. The research will include both biofuel and biobased chemical products. Murphy USA opened the first E15 (15 percent ethanol, 85 percent gasoline) station in Arkansas on Dec. 11. There are now more than 60 stations in 12 states registered to offer the higher level fuel blend. Could weeds, particularly problematic invasive ones, become a reliable cellulosic ethanol feedstock? It isn't likely in the near-term due to a fundamental dilemma, suggest a group of University of Illinois researchers. Brian Jennings, executive vice president for the American Coalition for Ethanol, said the advocacy group will host a webinar Dec. 17 on how to make comments to the U.S. EPA on the proposed renewable fuel standard (RFS) rule for 2014. The U.S. Energy Information Administration has released the December issue of its Short-Term Energy Outlook, maintaining the prior month's prediction that ethanol production will average 900,000 barrels per day in 2014. Novozymes and Monsanto Co. have announced a long-term strategic alliance to transform research and commercialization of sustainable microbial products that will provide a new platform of solutions for growers around the world. A study published by Agra CEAS Consulting shows that an uncertain policy environment in Europe is negatively impacting investment in first- and second-generation biofuels. Without additional investment, the E.U. is likely to miss its biofuel targets. Patriot Renewable Fuels calls RFS proposal a "slap in the face"
In an effort to increase awareness and understanding of the biofuels industry among both individuals and state and federal legislators, Patriot Renewable Fuels recently held a renewable fuel standard (RFS) roundtable and rally. Ineos Bio has provided an update on the operations at its Indian River BioEnergy Center, reporting the facility has made significant operational progress and is steadily moving towards stable operations in 2014.